Despite being a favourite vacation destination for celebrities, Anguilla's property prices are lower than nearby Caribbean islands such as the BVI or US Virgin Islands. Western Anguilla has seen the greatest amount of development over the past years. In Cul de Sac, US$6.95 million is the selling price for a seven-bedroom luxurious villa, situated in an exquisite 7,000 square foot gated location surrounded by 3.5 acres of landscaped gardens with its own private beach. In the Viceroy, located in Barnes Bay, villas and residences are priced from US$700,000 to as much as US$7 million. In Meads Bay, one of the most beautiful beaches in Anguilla, a four-bedroom beachfront estate home are priced at US$3.9 million while an seven-bedroom lavish villa is priced at US$14.5 million. In Rendezvous Bay, a five-bedroom luxury villa located in the CuisinArt Golf Resort and Spa was marketed from a price of US$6.95 million. In the Island Harbour, an eight-bedroom villa near the Shoal Bay is valued at US$6.5 million while a five-bedroom villa in the same area is priced at US$4.4 million. In the Little Harbour, a ten-bedroom luxurious villa with two swimming pools on its beautifully landscaped 2.5 acres is priced at US$17.5 million. A six-bedroom villa with its own secluded cove beach and stunning views towards the mountains of St. Martin is valued at US$4.9 million. On the other hand, a four-bedroom villa near the Blowing Point is priced at US$3.9 million. 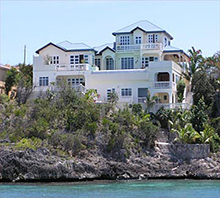 In the Captain's Ridge, villas and residences are priced from US$3.5 million to US$5 million. Now Anguilla's tourism sector is booming again. In 2015, the total number of tourist arrivals rose by 5.3% compared to the same period last year, to 186,068 people, according to Anguilla Statistics Department and the ECCB. From 2004 to 2007, Anguilla's average annual GDP growth was 14%. However, the economy contracted by 0.31% in 2008, plunged by 16.5% in 2009 and by another 5.8% in 2010. GDP declined by 1.2% and 1.8% in 2011 and 2012, respectively. The economy then expanded by a meagre 0.32% in 2013 before recording strong growth of 6.7% in 2014. In 2015, Anguilla's economy grew by a modest 2.24%, according to the Eastern Caribbean Central Bank (ECCB). Zemi Beach Resort and Spa - a new resort and residential development covering more than 1,000 square feet of white-sand beachfront in Shoal Bay East. The resort, which started to take reservations in November 2015 and opened in February 2016, offers 50 luxury residences. Prices for studios start at US$600,000 while two- and three-bedroom residences are priced from US$2 million to US$3.1 million. Zemi Beach Resort and Spa also includes other first-class amenities such as on-site restaurants, bars and lounges, a wine cellar, infinity-edge pools, a spa and fitness center, and an outdoor yoga terrace. Malliouhana Hotel and Spa - After a two-year closure, the legendary resort recently underwent full-scale renovation. It is set on 20 acres of beachfront land and offers 55 rooms, two beaches, two restaurants and bars, an extensive array of sports and fitness facilities, and a spa. CuisinArt Golf Resort and Spa - this new resort offers a total of 98 luxurious suites and private villas with pools. The project also includes a new hotel featuring a ballroom to accommodate 200 people (the first in the island). Other amenities includes acclaimed restaurants, an award-winning Venus Spa featuring Aquatherapy, a Fitness Center, and an 18 hole Greg Norman signature design golf course. Frangipani Beach Resort - situated on a beachfront location on Meads Bay, this luxurious 19-room boutique property has begun an extensive renovation of its reception area and pool. 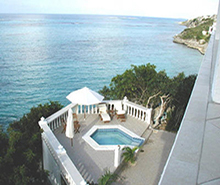 Anguilla Great House - this boutique beach resort has also undergone modernization, particularly its pool and pool deck area. It is famous for its lively cottages and breathtaking view of Rendezvous Bay. Cap Juluca - this development has reopened in December 2013 with some enhancements such as new menus and a refreshed Pimms, the resort's signature restaurant. Anacaona Boutique Hotel - it has also recently reopened with the addition of a spa known as The Balinese Petite Spa. In 2015 Anguilla's mortgage market stood at 40.5% of GDP, down from 44.4% in 2014, 46.8% in 2013, 51.3% in 2012, 53.5% in 2011, 57.8% in 2010, and 64.6% of GDP in 2009, due to the impact of the global financial meltdown. Mortgage interest rates in Anguilla ranged from 7% to 11.75% in 2014, up from 7% to 9.5% during the previous year, according to the ECCB. Anguilla's prime rate was 12%. Mortgage interest rates are linked to the US prime rate or the US LIBOR. The Eastern Caribbean dollar, the official currency of Anguilla, is pegged to the US dollar, at XC$2.70 to US$1. The maximum loan-to-value ratio is 70%, with loan terms of 15 years. While advertisements on timeshares and fractional ownership in Anguilla are widespread on the internet, no law in the islands allows for these types of property ownerships. With its area small (102 sq. km), the government restricts foreign land ownership. Anguillan law prohibits non-belongers (local term for foreigners) to own sandy waterfront or beachfront properties. These locations are reserved strictly for tourism or commercial developments. Government's policy allows non-belongers to purchase real estate only on rocky coastline, Cliffside or inland lots of up to half acre for building a house with a minimum gross external floor area of 2,000 sq. ft. Construction should be completed within 18 months from the date the license is issued otherwise penalties are charged or, worse, the land may be forfeited. With its 33 immaculate white-sand beaches, Anguilla has become a haven for the rich and famous. Celebrity sightings have included basketball legend Michael Jordan, actors Jonah Hill, Michael J. Fox, Liam Neeson, Ellen DeGeneres and Portia de Rossi, Sofia Vergara, billionaire Roman Abramovich, Shaquille O'Neal, rapper Drake and Queen Latifah, among others. Yet Anguilla remains relatively uncrowded, and has avoided the damage done elsewhere by over-development. A flat island, Anguilla is covered with arid scrub, growing out of solid rock, devoid of dramatic scenery. Visitors come to this island not for the scenery, but for its exceptional beaches. Small and lightly populated, Anguilla's residents (pop:15,000) are easy going. Since the island isn't good for farming, its people became seafarers, known throughout the Caribbean for boat building and fishing skills. Of its 33 pristine beaches, Shoal Bay is the most famous where A-list American celebrities have traditionally flocked. It made the decision in the 1980s to develop upper-end tourism, and concentrated on luxury hotels and villas. Anguillan house prices, rents, and letting income - real data! How expensive are houses in Anguilla, compared to the rest of Latin Caribbean? How much rent can be earned from Anguillan property, compared to the rest of Caribbean?